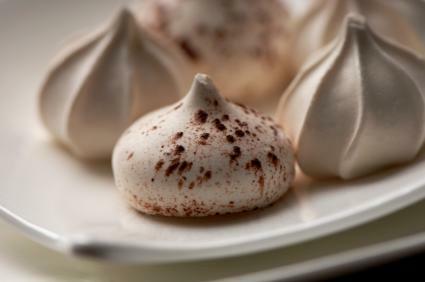 Almost a meringue, almost a nougat, soft divinity candy is a delightful treat that can be varied to suit your tastes or even used as a decoration on other desserts. When I was first getting interested in cooking, years ago when my age was a single digit, I discovered a cookbook that featured the characters from the Peanuts comic strip. Most of the recipes were pretty standard, including peanut butter and jelly sandwich and chocolate chip cookies, but there was also a confection that I had never heard of: Divinity. One of the first things I learned about making divinity was that two things were needed for a successful soft divinity candy: dry weather and a candy thermometer. While other confections are more forgiving when it comes to the temperature of the sugar, divinity, like fudge, needs more precision. Soft divinity candy will act like a sponge and absorb moisture from the air if you try to make it on a humid day. If you try to make divinity on a very humid day, you will end up with a candy that is a white goopy mess and not the soft divinity candy that you were looking for. Place the egg whites in the bowl of your stand mixer. You want to do this first so the egg whites can come to room temperature. In a large saucepan over a medium high flame, mix together the water, sugar, salt, and corn syrup. The corn syrup is there to add stability to the mixture, otherwise you run the risk of crystallization. Once the sugar has dissolved, stop stirring and place your candy thermometer into the pan. Increase the flame to medium and let the sugar cook to 252 degrees. When the sugar has reached about 245 degrees, start beating your egg whites on medium speed using the whisk attachment. Once the egg whites have been beaten to soft peak stage (this means that the egg whites form a droopy peak when you lift the whisk out of them and invert the whisk), replace the whisk with the paddle attachment. Once the sugar reaches 252 degrees, turn off the heat and let rest for two minutes. With the mixer running on high-speed, slowly and carefully pour the sugar into the egg whites. Beat the egg white mixture for ten more minutes. Add the extract and beat for about thirty seconds more. Spoon the divinity onto a cookie sheet that has been lined with parchment or wax paper. Let set for two hours. You can use peppermint, anise, or any other extract that you like. You can dip each divinity into melted chocolate for a chocolaty treat. If you like, you can use a piping bag to create fun shapes. Once you master the art of making divinity, you will discover that it has much more to offer than just a delicious white cloud of a treat. You can use it as decorations on a gingerbread house, dip the divinity into melted chocolate, dust the divinity with toasted coconut, or even use different extracts to change the flavor of the candy.